We live in the city of Chicago, and many of you probably know that we are in the midst of a teachers’ strike at the moment. My kids go to our wonderful neighborhood elementary school, made wonderful in part because of the awesome parent community. We have known that there might be a strike coming, though I think many of us were hoping it would be avoided. One of the neighborhood moms – who lived through a teachers’ strike herself as a child – invited about 12 neighborhood families with kids ages 5-7 to form a “co-op” at her house in the event of a strike. A couple of these families include current or former elementary school teachers who helped with a schedule and materials, and so my kids are going to a “strike school” at our neighbors’ house. The parents are rotating to cover days and keep 14 kids in a school-like routine. After lunch we split the kids into two groups and they took turns digging through my bag of leftover yarn and weaving on the cricket. 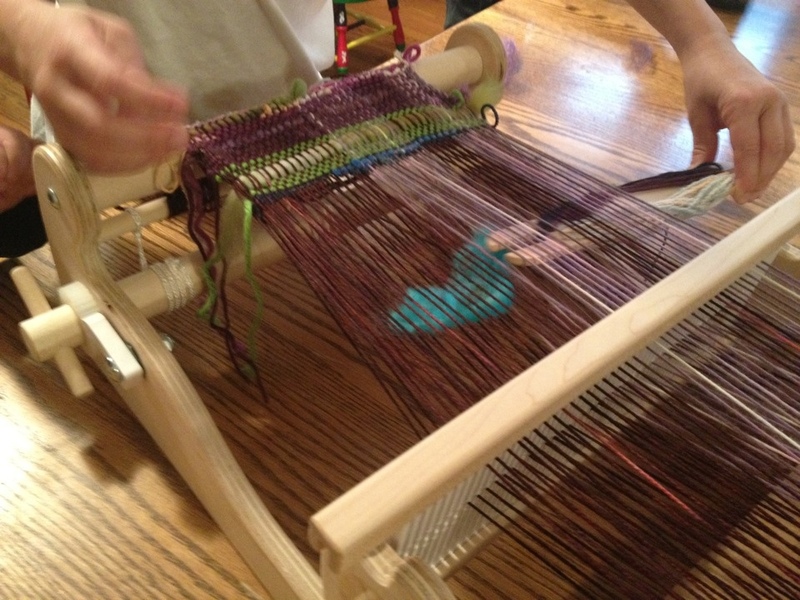 I also showed them how to incorporate bits of fiber (“fluff”) into the weaving. We also cut up construction paper to weave together to reinforce the concept of what weaving is. There were a couple of girls so into the weaving that they stayed inside to do more after everyone else went outside to play. 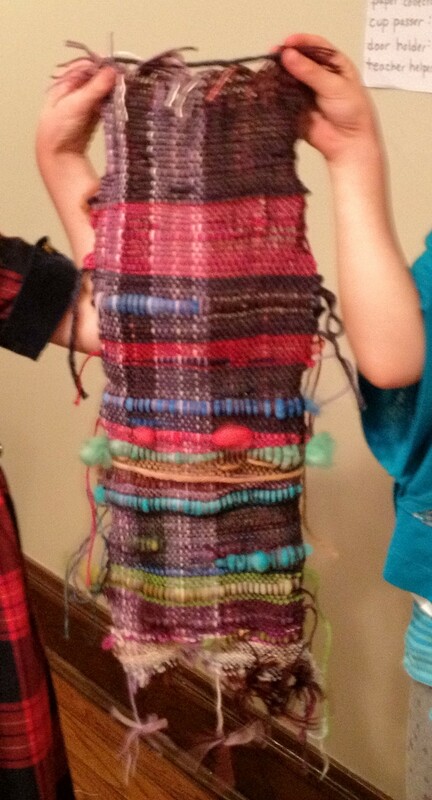 The same family has been hosting our strike school all week, so at the end of the day I wove some of the spinning sticks into the top and bottom of the weaving that the kids made and gave it to her. Anyway, it was all great fun. And now I know that if neither of my kids are into crafty stuff, I can always borrow a few neighborhood kids. Just after cutting off of the loom. All 14 kids worked on this in some way. I have been reading about the strike, and used to live in the Chicago area. I have wondered what happened to the kids on a strike like this. So glad to hear you all are trying to keep things as consistent as possible for the children. That woven piece worked on by all of them is awesome, and a great testament to the power of community. Wishing you all the best of luck as you keep going. ← Do I really need NINE new handwoven towels?